Have you been injured at work? Has this injury impaired your ability to perform your job? If so, you may be eligible for Workers' Compensation. If you are injured on the job or become sick as a result of performing your job, your employer is required by law to pay Workers' Compensation benefits to you and/or your beneficiaries. To receive Workers' Compensation it is not necessary for you to prove that your injury was the result of another person's negligence. 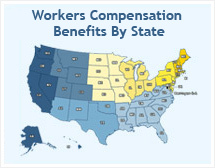 Workers' Compensation insurance is a no-fault system that provides six basic benefits. These include: vocational rehabilitation, supplemental job displacement benefits, temporary disability benefits, permanent disability benefits, medical care, and death benefits. This system benefits both the employee and the employer. Workers' Compensation entitles the employee to all necessary medical treatment and financial support when injured on the job. At the same time, Workers' Compensation insurance prevents the employer from being sued over injuries sustained by employees. If you believe you are eligible to receive Workers' Compensation benefits, and would like the professional help of a Workers' Compensation attorney, click here for a free evaluation of your claim.